I am kind of an anomaly when it comes to food. When I was young, I loved the cafeteria food my school system served. I hear jokes about school food and I laugh along but secretly, I don’t know what is this “joke” you speak of. Because apparently either my standards are lower than the rest of the population or not everyone had a school with such amazing food. Or awesomesauce if you will. Full fat. Non-paleo. Carbtastic. Not at all organic. You know, old school craptastic food. Wiener Winks are a credit to my lunch ladies. Not only were they cool to hang with….they were…..but they actually MADE the food. This recipe is an homage to Mrs. Balnoschan and her posse. Love those ladies like they are my own blood. And I let the kids make their own too. Lettuce, cheese, Frito chips, taco sauce…..this is where you are free to be you. I am following a similar path as the original taco bowl from my childhood but you can change it up as you like. I put it in separate bowls on the table so the girls can help themselves. And it’s okay to lick the plate clean. Head here for more four ingredient recipes. Brown beef and onion until beef is browned. Add taco seasoning packet and water according to packet directions. Let simmer for a few minutes. While that is simmering, prepare the toppings! Chop up your lettuce and get ready to assemble your bowls. 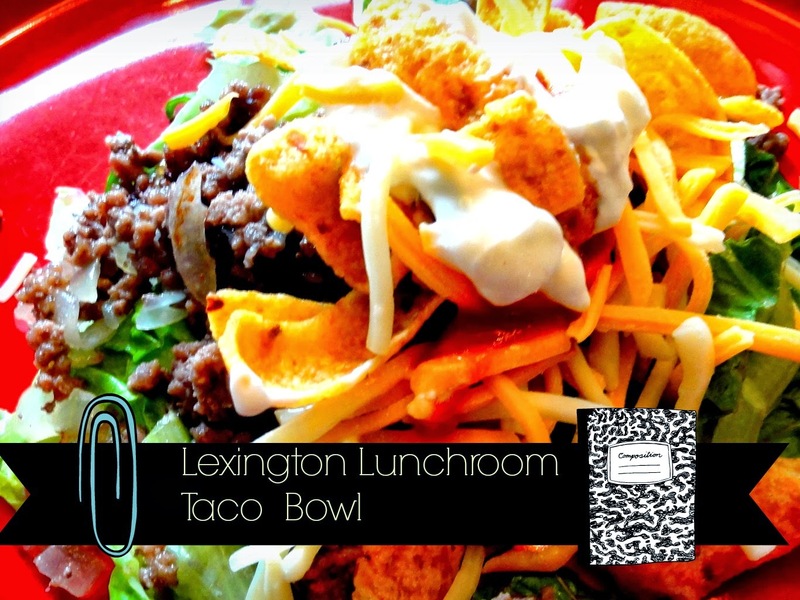 Layer in this order into the bowl: fritos, ground beef, picante sauce, lettuce, cheese, sour cream. This has Fritos so it has to be the best recipe EVER. Frito addict. It's okay, right? Ps. I loved the Tuna Salad at my high school. Most days? Tater tots and swiss cake rolls for me, but on Tuna Salad day? I was tray, all the way!! Pass the rectangular pizza, please. Omg I forgot about those!!!! We just had this Friday night….because Ty came home from college and wanted it……with buttered bread! It does ROCK!! Yes with buttered bread….now I am hungry…. I also put fritos on the bottom of our chili….yummmm. Please bring this to my Hen party. Details to follow. Taco bout and easy but delicious recipe. Perfect for my Cinco de Mayo party tomorrow!